ENG - Benvenuti su brassatodrum! We play in the streets and squares, on’ hard soil’ or on stage, but also to your birthday, Saint's day or wedding ... and if he/she still does not know that you want to get married, maybe a lovely serenade is what you are looking for! We are pleased to introduce you to the birth of the first Brassatodrum album , after a long gestation equal to that of a giraffe! AT LAST HERE WE ARE! 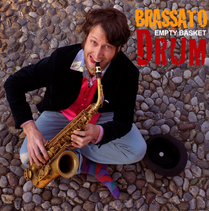 We called the album "Empty Basket" to exorcise the nightmare of every busker artist! if you want to get closer and get a CONTACT ... come and join us on the "everywhere" road! !